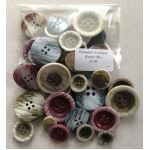 A lovely mix of pink, white, clear and natural buttons in a variety of sizes. Contents of each pack will vary. A button mix to of various sweetie influenced colours, including lime, candy pink, turquoise and purple..... Contents will vary from pack to pack.